It's Labor Day weekend, certainly, but with all due respect, that distinction pales in comparison to the one I wish to commemorate: The return of college football. I will first address the elephant in the room: Yes, my alma mater USF played competed had a game scheduled this weekend. That is the last I intend to speak of this matter. That said, I've had an excellent weekend celebrating and enjoying the sport's glorious return, including two live games. You may have noticed that I'm not yet in season form of giving you the Band on the Road Game of the Week before the action begins, but I assure you that will follow, and with this action-packed weekend, you're just going to have to forgive me. 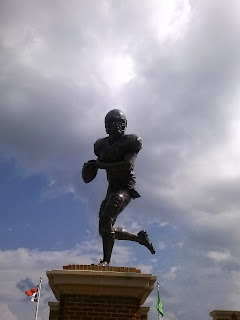 The weekend began Thursday at noon - certainly a favorable quallity in any weekend - as I headed south with my friend Eric to Columbia for the North Carolina-South Carolina game. I made the decision earlier in the year that since the first game of the season was so close, I'd look to head down. I reached out to Eric, who is a South Carolina alumnus, and not surprisingly, he was down for it. The trip down included a meal at the Palmetto Pig. If you find yourself in Columbia, I definitely recommend it. You had me at "All you can eat BBQ", but beyond that, it's damn good. We headed to the stadium and found ourselves a tailgate spot by the railroad tracks prior to heading into my first game in an SEC stadium. My StubHub-purchased seat was probably closer to the Goodyear Blimp than the field, but it was actually an excellent vantage point for the action on the field, the sizable jumbotron, and the Columbia skyline. The action got underway with South Carolina's vaunted 2001 entrance, and the stadium was at a fever pitch to start their team's 2013 campaign. Sandstorm kept the crowd going, and they really had no reason to let up, except perhaps for the fact that while it wasn't a blowout, the outcome was never really in doubt. In a move that I'm sure surprises no one, prior to purchasing my ticket I attempted some recon as to where the home and visiting bands sit. 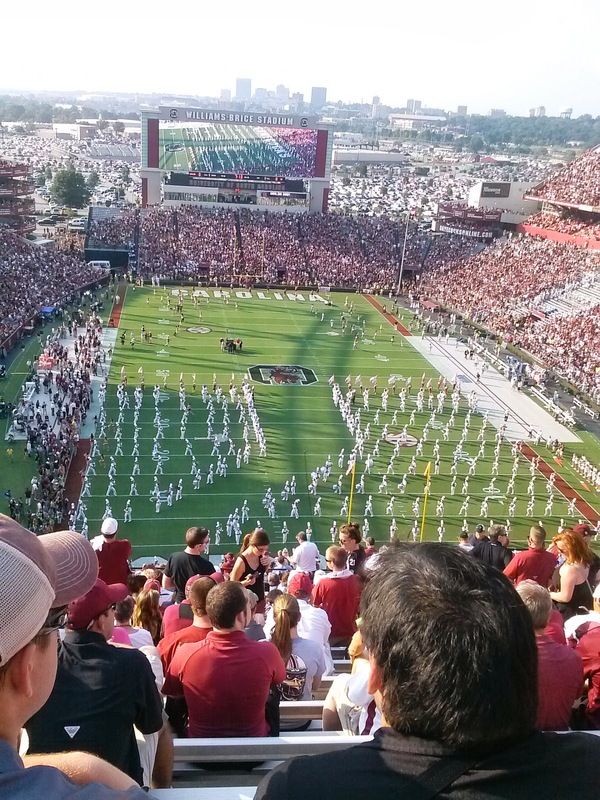 The folks at SB Nation's Garnet and Black Attack were able to help - one of their writers is a former Carolina Band member - but I already had my ticket at that point. My end zone locale was acceptable for the Mighty Sound of the Southeast, but the Marching Tar Heels, or rather the pep band contingent that they sent, were out of my line of sight and too small, physically and sonically, to be a factor from what I could tell. The home band was difficult to truly appreciate as well, but I attribute that largely to the location of my seat, as well as the crowd noise that a stadium of 80,000 can produce. The weather was brutal - the heat index was probably still pushing 100 long after sunset - but the game pressed on into the 4th quarter before it caused a break in the action. A thunderstorm suspended play midway through the 4th, and we were told to seek shelter, either in the stadium or elsewhere. Many, no doubt with the game's inevitability in mind, took the opportunity to head out; those of us who stuck around were rewarded with our pick of seats upon the restart. I, of course, headed down to the band section and got a much better representation of what they had to offer (as well as some video) from up close and personal. I stayed through their Amazing Grace/America the Beautiful closer before departing and ultimately hitting the road back home to Greensboro. The weekend hadn't officially started yet, but it was far from over. After being home on Friday, it was an early start on Saturday to head down to Charlotte. 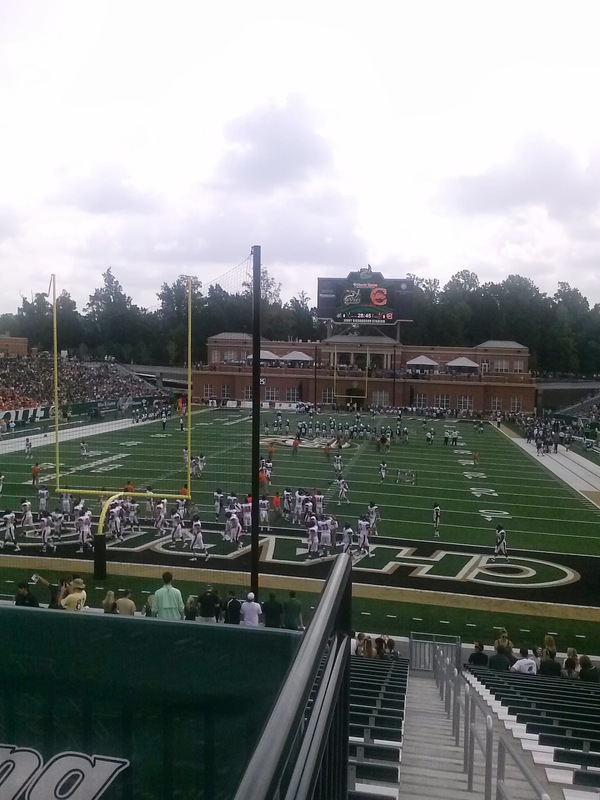 My friend James works at UNC Charlotte and invited me to join him at their inaugural football game this weekend I gladly accepted this opportunity to be there as history was made and Charlotte began its program. A noon kick meant breakfast tailgating. I made what turned out to be the right move and packed the camp stove instead of the charcoal grill. We found a fortuitous spot that was about a mile's walk along the greenway straight to the stadium. It wasn't a stadium lot, nor was it signed for tailgating, but we postulated, correctly, that as long as we were low key, we wouldn't have any problems. Indeed, Charlotte-Mecklenburg's finest rolled right by us with but a nod. After eggs, bacon, bagels, and beer, we headed on over to the stadium. The lines for the student section entrances were quite long, and while less daunting, there was quite a crowd at the general entrances as well. Indeed, the game was a sellout, and I believe tickets were pushing $200 on StubHub. 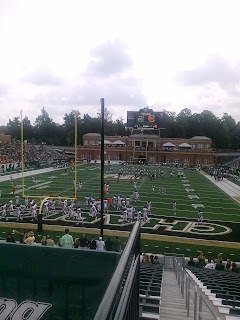 We entered well in enough time for the pregame festivities, which featured the UNC Charlotte drumline (they don't yet have a marching band) cheer and dance, and, of course, 15,000 screaming fans, rabid for football to come to UNC Charlotte. Also on hand were members of the only other football team the school has ever seen, a team that played in 1946-48 for the Charlotte Center of the University of North Carolina, which would go on to become Charlotte College and eventually UNC Charlotte. The 49ers got on the board in less than a minute, scoring on a pick six, and took early control of the game. They ultimately went on to defeat the Campbell Camels 52-7 in an excellent inaugural performance against the in-state foe and fellow Division I squad. The crowd, especially the student section, thinned in the second half, certainly due in no small part to the lopsided score and the brief rainstorm, but I'll admit that both felt good in the late August heat. One thing that was nicely nostalgic: I have no particular affinity for UNC Charlotte, but it sure felt good to be at a football game amidst a sea of green again. While Charlotte's institutional colors are green and white, gold is often used as an accent (due in no small part, I'm sure, to the 49ers moniker) and it was really reminiscent of a USF game. To think, just 16 years prior, folks had the same experience at old Tampa Stadium to welcome the Bulls into being. After hitting a local wing spot and again returning home to Greensboro, there was more football to be had, and it continues into tonight as FSU and Pitt cap the weekend. Welcome back, football. Don't ever leave.